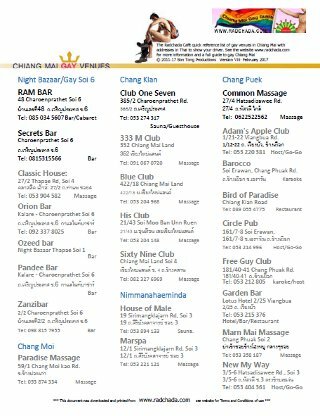 We operate this English Language website to provide useful information for the benefit of gay and LGBT visitors who live in or visit Chiang Mai. As gay people ourselves we fully understand the privacy issues surrounding matters of sexuality and collect the minimum of data possible to interact with you, provide a good experience for website visitors and respond to any questions. If you sign up to receive our newsletter by email we collect your name (you can use a nickname if you wish) and email address. When subscribing you confirm your consent to us sending newsletters to you that we think may be of interest. We will do this no more than six times per year. when you sign up to our mailing list we send an email to you asking to confirm your email address and that you consent to us sending newsletters to you before adding you to our mail list. Once confirmed we will send you a further email confirming you have been added to our mailing list. This email will include links that allow you to unsubscribe automatically at any time. All newsletters we send you will also include an unsubscribe link. Your name and email address is stored in a secure database on our web server. Users may opt out of personalized advertising by visiting www.aboutads.info. Our website uses Apache severs which collect the following data every time they serve a web page: IP address and device identifier, Request date/time, Page requested, Bytes served, User agent, Referrer, Error logs. Analysing the pages most frequently viewed by visitors and server performance to help us improve the content we provide and the user experience. Security monitoring to create alert systems in the event of any unauthorized intrusion and detect and prevent hacking attempts. system slowdowns and other software issues and general maintenance. Names and email addresses submitted to our newsletter are retained indefinitely unless or until deleted by the subscriber. Log files are retained on the server for 30 days after which they are automatically deleted. Our website is served to you over a secure https connection and email servers use SSL encryption to protect the contents of emails.